So back to my Plum Planner – I started using it in November but hadn’t delved into doing anything but writing down my work and K’s school schedule. It wasn’t really working the way I wanted it to. Then my bestie told me about decorating it (say what?! Lisa Frank anyone?). I checked out her Instagram and joined a few groups on Facebook and oh my! It’s like a light shined straight down from heaven! My love of crafting was mixed with my need to have a more functional way to keep my life organized! And down the rabbit hole I fell. So many names, brands, stickers, washi (think smaller, thinner duct tape), and Etsy. Now, all of that can definitely get pricey if you let it; BUT, the crafter in me knew I could create my own for way, way less. Don’t get me wrong, I love the convenience of already made and cut stickers and some of them are just downright beautiful, but I just can’t justify spending money on something I can make myself. Plus, I can make it exactly how I want. Now I know some of you are thinking, what? Are you 8? Hear me out… It’s a lot like scrapbooking. 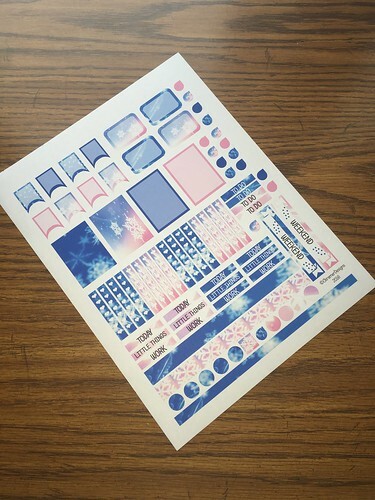 You create weekly “layouts” using stickers and washi but you have your weekly plans instead of pictures (unless you choose to go that route – I don’t personally). It’s functional and makes me WANT to accomplish my tasks. It also gives me a creative outlet and an hour each week for just me. The very first one I created was for the blizzard earlier this year and features a beautiful blue and pink snowflake theme. You can download the Plum Planner version here. My goal is to release something new at least 2 times a month (I have 4 kids – 3 who are 4 and under so that may not always be doable). I have a few more that I’ll be posting over the next few days so enjoy and I can’t wait to see your layouts! Leave a comment below and tell me what you like about the theme and if there’s anything different I can do for future.